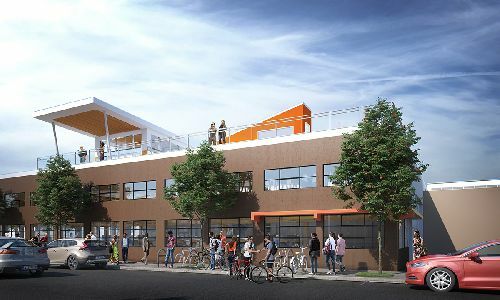 Capstone Partners and joint venture partner Premium Property USA Inc have acquired a coveted two city block section of properties in Portland’s Central Eastside Industrial District that will be redeveloped into 72k sf of creative/technology office space. This will be the fourth project the firms have developed together in the Portland area. The venture plans to repurpose the existing industrial buildings, originally built in the 1940s and 1950s, into a new high-end creative office/tech and artisanal food and beverage maker hub to be known as Custom Blocks. Construction is set to start in early February with shell completion and occupancy for tenants by November 2017. Located at SE Madison, 10th Ave and SE Main St, Custom Blocks is located adjacent to the New Deal Distillery, and within a short walk to the The Redd, LOCA, and many other well know coffee roasters, breweries and other artisanal makers. The site formerly served as the Custom Stamp and Manufacturing plant for nearly 50 years before it shuttered operations. Capstone Partners named this landmark project Custom Blocks to honor the history of Custom Stamping and its unique contribution to the industrial character of the neighborhood. Brad Carnese with Cushman & Wakefield represented the seller, owner/operator Custom Stamping & Manufacturing Co. In addition, Carnese along with C&W colleagues Tom Usher, Mark Carnese, Doug Deurwaarder and Matt Johnson, have all been retained by Capstone and to handle the leasing of Custom Blocks.